Wingsling provides the proper elevation helping to minimize pain & swelling. Provides easy on/off use and is machine washable. 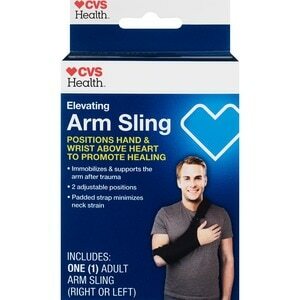 CVS Health" Elevating Arm Sling positions your hand and wrist above your heart to promote healing. The one-size-fits-most, two-in-one design also allows the user to position the arm at a 90-degree position with full range of finger motion at both settings. The comfortable padded cross-body support minimizes neck strain for long-wear comfort. Lay sling flat with elastic elbow pocket aligned with elbow of injured arm. Clip strap to upper/top ring leaving the lower/bottom ring unattached. Snap shoulder strap to both sides of sling with buckle facing out. Put shoulder strap over head and behind shoulder with elastic pocket near elbow of injured arm. To shorten or lengthen overall size of sling, adjust buckle closest to clip end. Put injured arm into sling with elbow back towards elastic elbow pocket. To elevate, pull adjustable buckle strap to desired elevation. For additional comfort, go back to Step 3 and unsnap shoulder strap. Slide shoulder strap through strap pad, padded side down. Position pad over buckle for desired comfort. Re-attach shoulder strap to sling.